With immensely bright emission properties and highly specific targeting capabilities, non-toxic CPN molecular probes have many advantages over traditional dyes in a variety of R&D applications, including in vitro imaging and labelling. 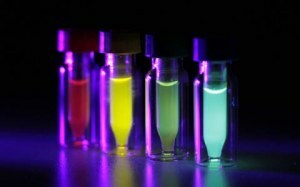 CPNs are highly fluorescent nanoparticles containing semiconductor light emitting polymer (LEP) cores encapsulated within a water friendly capping agent. With fluorescent properties significantly exceeding those of other molecular probes and labeling agents, CPNs offer immense brightness due to exceptional extinction coefficients and outstanding photo-, thermo- and chemical stability. CPNs have shown no toxicity and are ideal for use with live cell systems and are enabled with surface accessible carboxylic groups for the conjugation of a wide range of molecules including antibodies, streptavidin and nucleic acids. This allows CPNs to be used in a diverse array of binding and targeting applications, such as flow cytometry, immunohistochemistry, immunocytochemistry, and high content screening. CPNs also incorporate iron oxide, allowing for magnetic manipulation, purification and quantification of bound molecules or cells, and use as contrast agents in MRI. CPNs are currently available in a range of fluorescence emission wavelengths from 450 nm to 680 nm. CPN products retain immense fluorescence much longer than existing technologies, whilst remaining chemically and thermally stable. But why are they so bright? The robust nature of its components means the optical, biological and structural properties of CPNs are rapidly being considered to be superior than market equivalents. A core-shell structure enables CPNs to be conjugated to a variety of targeting molecules. There are numerous applications where CPNs can be used. The list is extensive and includes FRET, ELISA, flow cytometry, western blotting and more.